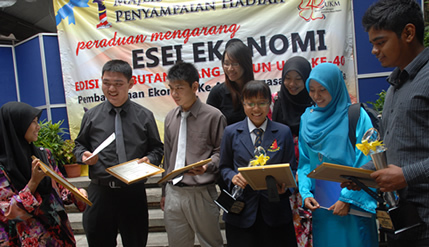 BANGI, 29 Dec. 2010 – A student from the Secondary Vocational School Nibong Tebal, Mohamad Fazul Rahman Mohamad Yunus has been adjudged the winner of the forms 4 and 5 category in the UKM’s Economic Essay competition held in conjunction with the university’s 40th anniversary celebrations. He was among the 24 students judged as winners for the three categories of the competition. Fazul received RM1000 cash, a laptop computer and a certificate. Runners-up for the category were Cheong Kang Jin from Methodist Secondary School, Sibu, Sarawak and Nur Farahin Nadia Mustafa Kamil from Mara Junior Science College (MRSM) Besut, Terengganu. Cheong received RM700 while Nur Farahim RM500 and a certificate each. For the sixth form and matriculation students category, Stephanie Lonna Anak Juti from St. Thomas Secondary School, Kuching, Sarawak was adjudged the winner with Nur Syafiqah binti Mohd Nasir from Puncak Alam Secondary National School, Shah Alam, Selangor as the first runner-up and Teoh Khar Chuan from Chio Min National Type Secondary School, Kulim, Kedah as the second runner-up. Stephanie received RM1200 cash, a laptop and a certificate while Nur Syafiqah received RM1000 and a certificate and Teoh RM700 and a certificate. For the Institutions of Higher Learning category, the winner was Norzanita Muhammad Mukhtar from the Faculty of Economics and Management (FEP) UKM, Bangi. She received RM2000 cash, a lap top and a certificate. Second place went to Chai Yu Zhen from the Science and Technology Faculty of UKM while Fatin Aminah binti Hassan also from FEP, UKM was judged as the second runner-up. Chai Zu Yen received RM1500 and a certificate while Fatin Aminah received RM1000 and a certificate. Fifteen other students received consolations prizes with five from each category. Those from the forms 4 and 5 category received RM100 each while those in the sixth form and matriculation category RM150 each and students from Institutions of Higher Learning RM200 each. They also received a certificate each. The prizes were handed over by the Dean of FEP, Prof Dr Mohamad Fauzi Mohd Janil at Lecture Theatre 1, FEP yesterday. Present was Chairman of the Economics Study Centre, Prof Ishak Yusof and the Chairman of the Competitions Committee, Dr Tamat Sarmadi and other committee members. Prof Fauzi said the competition was aimed at providing a platform to students to air their views on current economic issues. It was also an effort to increase written materials on the economy in the Malay Language. It is also deemed as an important initiative to bring the faculty to society and especially to secondary schools and those taking their matriculations as well as those in the institutions of higher learning with the hope that they could be potential students of UKM. Winner of the forms 4 and 5 category Mohamad Fazul said that it was the first time he has won the competition as previously he only managed to get the consolation prize. He hopes to continue his studies at UKM to follow his sister’s footstep who is a graduate of the faculty. Stephanie Lonna who wants to be a writer was very happy to win in her category while Norzanita was thankful to UKM for giving her the opportunity to take part in the competition and is also interested in writing.